Late this past Sunday evening, it suddenly dawned on me that I had been dwelling on and dedicating more time and effort to my participation in this afternoon's panel than on my involvement on anything similar to this in maybe 25 years. This preparation was in part due to the fact that what we are talking about here today IS very important and I am very honored to be a part of it. I can only hope that what I'm about to share with you now will be worthy of your consideration and thinking. This has really been a wonderful meeting with lots of great efforts and successes having been shared. The word, “partnership,” for instance, has been mentioned more than 180 times today and this is a good thing. And at least to this point, there hasn't been any booing or heckling. Let me begin with a story and a reflection about the poster photo that is there to the left of the main audience. 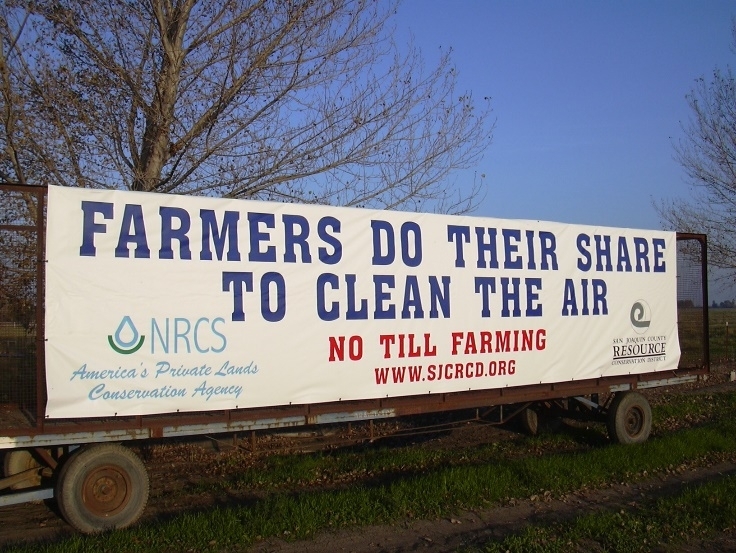 If you remember driving up I-5 about ten or twelve years ago on the right side of the road just south of Stockton, you could see this large billboard that said, “Farmers do their share to clean the air,” with NRCS and RCD logos on it. It was actually out there for a number of years. The only problem, however, was that there was not a no-till farmer within many, many, many miles of the billboard and there were no no-till farmers within many, many, many miles of that first farmer. My first point is the question, - Do we run a similar sort of risk with the soil health campaign as is shown in this billboard? Yes, there are some very good things going on, but there are also many rather large opportunities to improve things. I think we need to avoid or resist the sheer hype that seems to be catching on regarding soil health. Also, just how are folks going about soil health communication anyway? Exactly what is being communicated? There is more and more being thought and done about science communication these days, and maybe the soil health campaign might benefit from our putting our heads together within a broader arena or network, and coming up with good plans for outreach. For instance, how should the actual messaging about soil health be undertaken? … From a THREAT kind of an angle that conditions are declining and demand attention, or, … from an OPPORTUNITY perspective aimed at benefits of improving soil functions? Just what is being conveyed to the people who are being targeted? These are questions that maybe need further exploration. 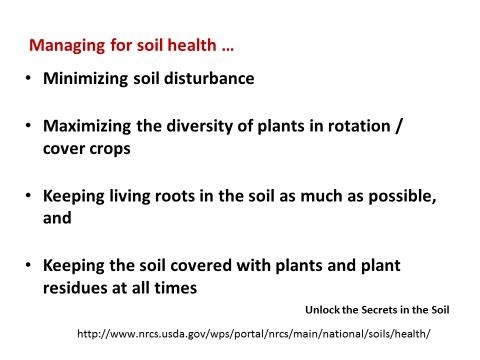 My second point has to do with the other poster that is to the main audience's, - right, - the 4 NRCS soil health principles. If we eliminate the stunningly beautiful vineyard systems of Mendocino County, - that are already approaching, mimicking or emulating of natural ecosystems, and if we further discard the assorted walnut and almond orchards, - where there already is very little disturbance and folks also can add native or cover crop vegetation in inter-crop periods to pretty much achieve implementation of these principles within the constraints that were mentioned earlier in the day, - we are left with largely annual cropping systems or sectors. And while there are some who project that trees and vines will eventually blanket all of the State, I am still somehow hopeful that the tremendous diversity of annual cropping systems will also find a way to persist. However, there is actually very little sustained, consistent adoption of these principles going on in annual crop systems. I know of actually only 7 farms in California where this is occurring, - where a consistent, sustained integration and implementation the soil health principles is taking place. Farmers, as well as sometimes all of us, may think we're actually doing better than we are, as evidenced by a variety of surveys our Workgroup has conducted with farmers about their self-reported adoption of conservation tillage. - A surprising 53% of them say they're using CT approaches when in reality, the percent if far lower. 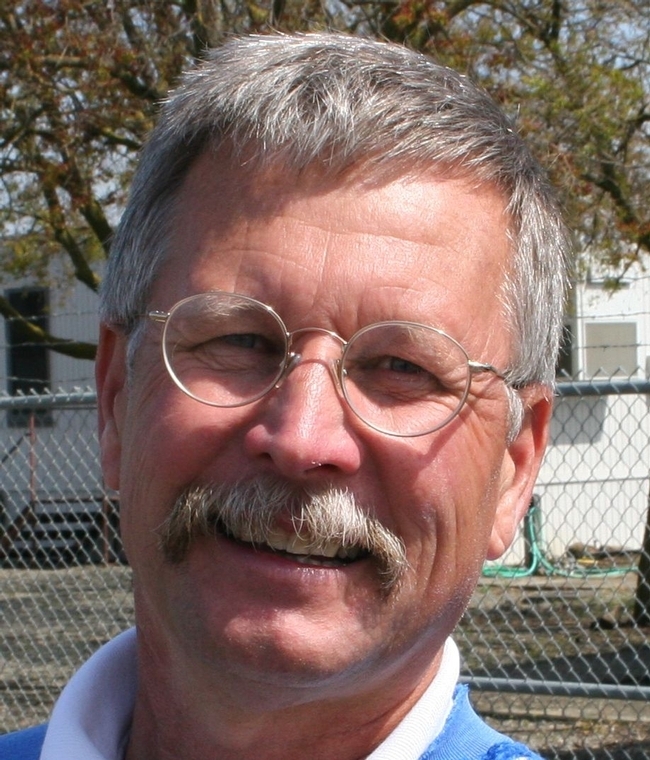 - If NRCS wanted to truly have an impact on soil health, they could perhaps close up their office in Ukiah and move it down, say, to Kings, Kern, or Fresno counties. - Now while that is only a bit of a joke, perhaps the underlying idea, - that some sort of prioritization and tactical planning related to where energy should be best spent to move the overall goal forward would be in order by the prime movers of the NRCS and CDFA soil health initiatives. There are some sectors that are already quite advanced, while there are others less so. This then, is my third point, - that there is a considerable range with respect to the uptake of soil health practices across the State's farmland and maybe this needs to be thought through a bit more. And further, in places where progress has been lagging, California is actually way behind efforts and progress in many other places with respect to adoption of conservation agriculture systems and in the use of practices commonly associated with soil health, and in the existence of mechanisms that can help people get there. - A lot is clearly needed. Not just throwing our hands up when facing all the diversity that exists in California with respect to climate, environments, and crops. Those who “play small” and are apologists for the status quo rarely move things forward. In addition, from some of the advance publicity that was sent out for this summit, and by the way, those responsible for this outreach really did their job. There were recent days when I was receiving seems like 7 or 8 announcements. From this publicity, one might have thought that part of today's summit goals was aimed at identifying management aimed at achieving soil health results. Folks, - this is well known, well agreed to. My fourth point has to do with the actual goals of the soil health campaign as currently formulated. What actual results are being sought? I have asked for clarification on this from NRCS and there have been unfortunately not much in this regard. CDFA seems to have a perhaps more cohesive or comprehensive vision in mind that perhaps comes also from their parallel work with emissions reduction and climate-change and water use efficiency-addressed goals, but I would very heartily encourage their pushing very boldly forward with ambitious goal setting. Let me share two short stories with you to illustrate this point. The first of these has to do with an effort that is a partnership between farmers, private sector, NRCS, university and other folks from CA, AZ, and NM, - with several of you here today involved, that is looking at designing, testing and refining production system alternatives that are looking “25 years out,” and anticipating goals and techniques that will be needed at that time in the future. This group is focused on vegetable production systems and is actually contemplating no-till lettuce production systems as part of its work. A second example is a farmer friend of mine in Santa Nella. One day, he and I were sitting in his truck exchanging ideas and information on “CTF,” – controlled traffic farming systems. The idea here is that if you can manage to restrict tractor and implement traffic within a field to certain limited traffic zones, that you could then preserve crop growth zones in between that would be essentially undisturbed. My friend was a tomato farmer and as I was pulling up videos and information on CTF applications from Denmark and other places in the world, he was simultaneously pulling up the very same videos that he himself had found and that provided ideas to him for how to actually begin to achieve controlled traffic systems in his tomato fields. It was nothing short of amazing to see his innovation and “can do” spirit. What these two examples do is shed light on the tremendous, and maybe to some of you, unexpected willingness to tackle very, very hard challenges and to overcome them. To me, this is utterly inspiring and I would seriously hope that more of this spirit of overcoming obstacles gets somehow into your soil health campaign. I encourage you in your incentives programs to set a very high bar for the applications that you receive. Encourage true innovation that does not merely incrementally plod forward. Go big and be ambitious with your incentives programs. Lastly, and to now wrap up these reflections and suggestions by considering with you a bit more on the goal-setting notion. If, after all, our collective goal is to increase the adoption of conservation agriculture, soil health, and climate-smart systems, that it is actually more about the “SYSTEMS AGRONOMY” of it all than merely soil health, per se. Scaling up, or increasing the adoption of conservation agriculture, soil health and climate-smart systems will involve efforts focused on much more than just soil health. It will involve, - having first of all,- our coming up with a much better set of goals relate to just what results we're actually trying to achieve, - with a very full, comprehensive understanding of the “systems” changes that will be needed. Borrowing from international circles, and areas where such major changes toward improved performance systems have been made, the term, “SYSTEMS AGRONOMY,” applies here for us, I think. People who've come to use this term recognize that there are perils in being dogmatic regarding the importance of but one aspect of the entire endeavor. There are parallels, I think, for us here in terms of our need to broaden and not restrict our emphasis and vision. How we “manage systems is where we need to be,” not just preoccupied with one aspect of it all, such as soil health. The second part of the term, “SYSTEMS,” gets more at, - again in the experience of international workers who deal with these sorts of farmer adoption processes and goals, - has to do with the actual communication and innovation mechanics that can best enable or facilitate change toward improved performance systems. We have much to learn and to do when it comes to the adoption process, and, as already has been mentioned a couple of times earlier today, with the California farm demonstration network that many, many stakeholders are now working to develop and expand, I am quite hopeful that as long as we keep our vision broad and ambitious, and dedicate ourselves to far more creative and challenging endeavors than the sloganeering campaign that has sometimes come with the soil health effort, that we will achieve truly great results. Two summary interviews of CASI's Jeff Mitchell by local Fresno, CA KMJ 580 AM Radio Producer Don York are available below. The two short files capture three of the major outcomes and benefits of soil management that were discussed at the June 6th soil health training that was held at the University of California's West Side Research and Extension Center in Five Points, CA. Anyone who would like to visit the long-term study site in Five Points where reduced disturbance and cover crop production practices have been in use for 18 years is encouraged to contact UC's Jeff Mitchell at (559) 303-9689 or jpmitchell@ucdavis.edu to arrange a tour of the field site. Please click on the links below to hear these interviews. 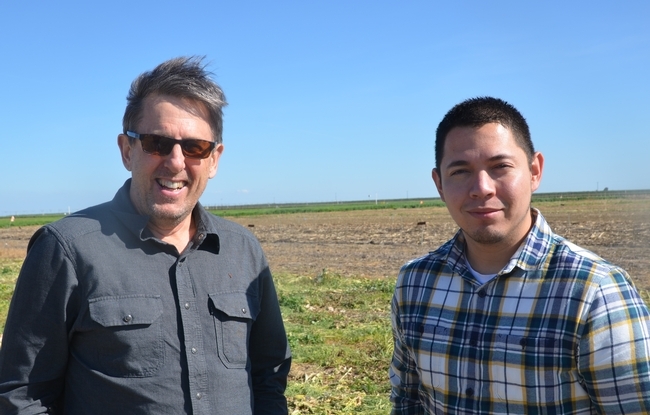 The US Manager of BCI, the Better Cotton Initiative, Scott Exo, and BCI's San Joaquin Valley Coordinator, Carlos Silva, visited the longstanding NRI Project field in Five Points, CA on March 28, 2017 as part of a tour hosted by CASI's Jeff Mitchell. BCI is a not-for-profit organization that encourages a holistic approach to sustainable and brings together people who are involved in cotton's complex supply chain, - from farmers to retailers. Initiated in 2005, BCI exists to make global cotton production “better for the people who produce it, better for the environment it grows in and better for the sector's future, by developing Better Cotton as a sustainable mainstream commodity.” Exo and Silva visited the NRI Project field to learn about the work that has been done over the years on cotton production in this field using no-tillage and cover crop practices and the benefits that stem from the use of these approaches in lower costs, fewer dust emissions, greater carbon and nitrogen storage in the soil, increased soil aggregation and water infiltration, reduced soil water evaporation, and other positive changes in soil biology that have been documented since the project was started in 1999. They also discussed with Mitchell the California Farm Demonstration Network, a broad group of partners who are working throughout the State on establishing local farm demonstrations of improved performance, conservation ag, climate-smart and healthy soils systems, and BCI's potential involvement in the network as a partner. A final summary of the many lessons that surfaced during the five farm visits that were held back in May and June is now posted at the CASI website at http://ucanr.edu/?blogpost=21603&blogasset=85918. Additional farm demonstration evaluations are being established and we hope to have more opportunities to share this work in the near future. If you are interested in becoming involved with the farm demonstration network, please contact us at (559) 303-9689. An audio archive of the KFCF 88.1 FM radio program of Tom Willey's "Down on the Farm" segment for July 1, 2016 that included interviews with CalCAN's Renata Brillinger and our own CASI's Jeff Mitchell is now posted at the CASI website. This hour-long interview included discussion of the State's GHG emissions offset programs by Brillinger and information on our farm demonstration network from Mitchell.